January 1, 2018 "Instructions For Irs Form 1099-k - Payment Card And Third Party Network Transactions" contain the latest filing requirements for the IRS-issued Form 1099-K. Download your copy of the instructions by clicking the link below. IRS Form 1099-K is tax form released and collected by the Internal Revenue Service of the United States. payees of third party network transactions. qualify as TPSOs and do not report under section 6050W. 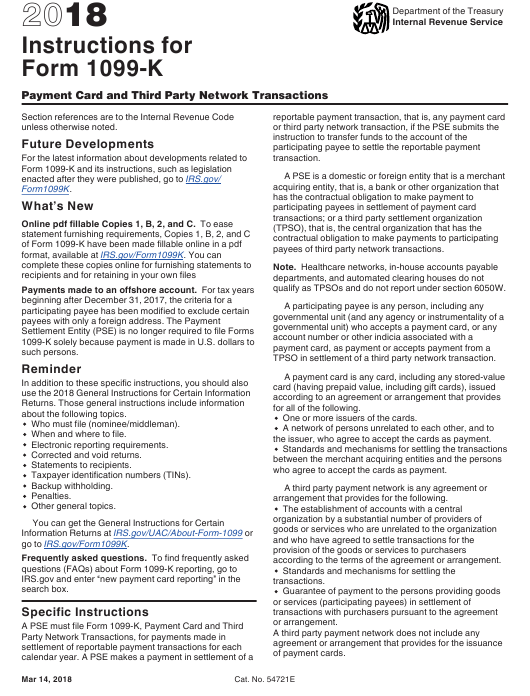 TPSO in settlement of a third party network transaction. for all of the following. the issuer, who agree to accept the cards as payment. who agree to accept the cards as payment. arrangement that provides for the following. according to the terms of the agreement or arrangement. under Code sections 6042, 6045, 6049, or 6050N. the rules of sections 267(c) and (e)(3), and 707(b)(1). made to an account maintained outside the United States. of the Code and its regulations). associated with the participating payee. participating payee is a U.S. person. the contractual obligations with the participating payee. described in Notice 2011-71 are satisfied. payee is a U.S. person. the instruction to transfer funds must file the return. under sections 6721 and 6722.
participating payee can certify its non-U.S. status. arrangement or agreement with the participating payee. Payments need not come from the facilitator's account. States (the States and the District of Columbia). transactions are non-reportable under section 6050W. Information Returns for more information on penalties. is accepted by a merchant or other payee. the issuer of the payment card. whom you distribute the payments. under section 6050W and not sections 6041 or 6041A. discussed later under Box 1a, is disregarded. participating payee for that calendar year. Certain Information Returns for more information. requirement (payer) in the box in the upper left corner. amounts, fees, refunded amounts, or any other amounts. EPF or other third party. payment card transactions reported on this Form 1099-K.
payments reported on the form. corresponds to the description of the payee's business. for its payees, you should not complete this box. reporting the gross amount from each type. aggregately reported in box 1a. regarding the Combined Federal/State Filing Program. to section 3406 backup withholding. number assigned by the individual state. use in filing the payee's state income tax return.